This Diwali I was surprised to find out from an Indian colleague that the traditional story of the Hindu Lord Ram winning against the evil Ravana and returning back home is not the only story about Deepavali. There are other stories that the lower caste Hindus (Dalits) believe in. 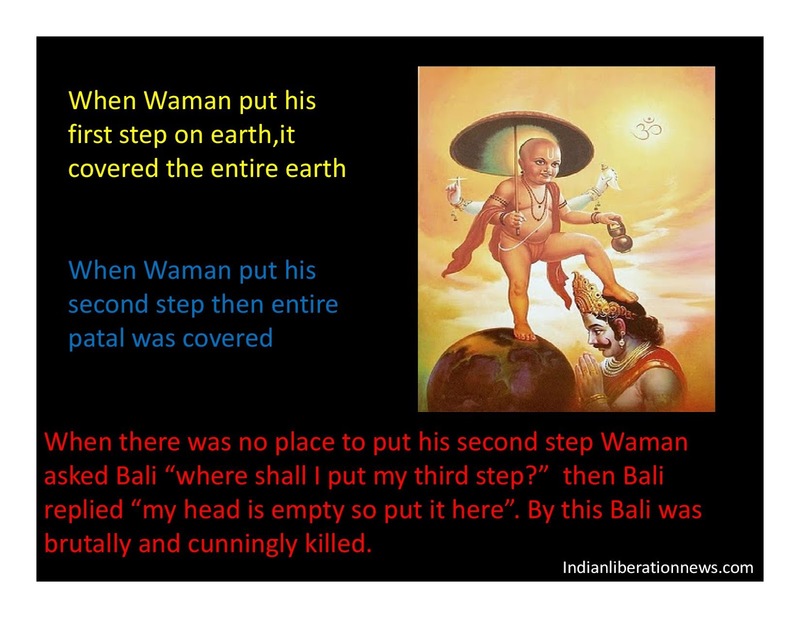 The most popular story among them is about a just king called Bali who was killed by a Brahmin (high caste Hindu) as they were not happy because of Bali' prosperous kingdom. I found the detailed story here. More details also available here. The other one is about the Asura King, Naraka. After terming Mahishasura a hero during Dasara festivities, Dalit scholars of Osmania University have now outraged orthodox Hindus by lionising Narakasura, whose killing by Lord Krishna is celebrated as Diwali. These scholars contend that Narakasura, the son of the earth goddess Bhudevi, was no demon but a king who was defeated in battle by Lord Krishna and Satyabhama in a deceitful manner. As people celebrated Naraka Chaturdasi on Thursday, a group of Dalits in the Osmania University observed it as vardhanti (death anniversary). They also offered floral tributes to a picture of Narakasura in the Arts College Campus raising hackles among conservative Hindus. The scholars asked people not to celebrate Diwali and claimed that Dalits belonged to the lineage of Narakasura and other so called “demon” kings who they say have been portrayed as evil by upper castes. OU SC, ST, BC and minorities students also organised a seminar ‘Narakasurudu — Raakshasuda (demon) or Rakshasuda (protector)?” wherein participants claimed that history has been distorted to project all those who lost wars as demons. In a reversal of traditional Diwali beliefs, students held that Naraka, the Asura killed on Diwali day, was not demonic as portrayed in the popular myth. According to a local belief, Narakasura was a Dravidian emperor who had ruled a massive kingdom that was destroyed in Aryan invasion. Naraka, according to this interpretation, is also believed to be of Dalit lineage thereby making mourning ceremonies of his death, the apt celebration on Diwali, at least for a section. While the origin of the lore is not dated, a section of Adivasis and Dalits in Karimnagar and Khammam districts worship Narakasura, students who held the commemoration pointed out. As a reflection of this belief, in Osmania University (OU), Hyderabad and Kakatiya University (KU), Warangal, close to 50 students erected idols of Narakasura even as they sang songs to praise the king’s greatness. Quoting the lore which is based on a re-reading of the popular Diwali myth, students held that Naraka was in fact a scholar who had held several scholastic sessions from time to time in his palace. “He was a nature-lover, a son of the soil. His death has to be mourned and his life should be commemorated,” said Naliganti Sharath, a student who participated in commemorating the Asura’s death, on the OU campus. “My family always narrated stories of Narakasura as a celestial power which had saved children from deadly diseases. We do not celebrate Diwali,” said Rajesh, a student of Kakatiya University. The lesson I learned was to check with my Hindu colleagues in future if they believe in Diwali and what version do they believe in.